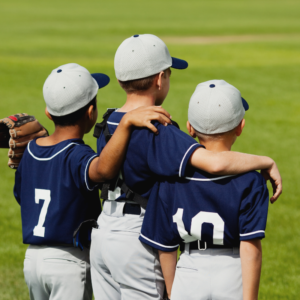 Youth sports can be an excellent way for children to learn about teamwork, remain in optimal health and foster strong, long-lasting relationships with their peers. More competitive team sports, such as football and basketball, can also inspire a healthy dose of competition in young children and even encourage them to be leaders one day. Before entering your child in athletics, it’s always wise to make sure you follow certain safety best practices to prevent injury. Consult the following guide before enrolling your child in an athletic activity. Some children might not be aware of the signs and symptoms associated with specific injuries. For example, studies have shown that children often don’t report symptoms of a concussion because they don’t know what they feel like, according to the Sports Concussion Institute. Teach your children not only about the signs and symptoms of more serious injuries, like a concussion, but also let them know the importance of speaking up about these symptoms. Because children might be nervous about appearing weak or will want to continue playing, they might not tell their parents or coach about symptoms they’re experiencing. One way to ensure children enter athletics safely is by making sure they have the appropriate equipment, and that what they will be using—from wrist pads and elbow pads to helmets and mouthguards—meets the highest safety standards. The Centers for Disease Control and Prevention recommends not only making sure the equipment is in good condition, but also that it fits appropriately and is worn correctly by children at all times. Poorly fitting equipment can increase the likelihood of injury. According to the University of Michigan, one cause of injuries in youth sports can be not enough pre-season conditioning. You can lower risk of injury by keeping your children active during the off-season. In addition to teaching your children about the symptoms of more serious injuries like concussions, you as a parent should know these signs so you can be on the lookout for them. Confusion, clumsiness and memory loss are early observable signs of a concussion. Work with your child’s coach to have an action plan in place if your child is injured. The NCYS notes that most programs will have an emergency plan in place that has already been reviewed by an athletic trainer or emergency medical service. But it can’t hurt to make sure the plan in place meets top safety standards. By following the above steps, you can rest assured your child will be as safe as possible before his or her first game.